Verbum is a powerful way to engage the Tradition of the Church. Just as you shouldn’t read any book of the Bible in isolation, why would you read any book in isolation? Dynamic footnotes, powerful search tools, and advanced note-taking options make Verbum a powerful research assistant, helping you explore and connect Scripture, Church teaching, and the works of Catholic theologians past and present. The St. Paul Center has partnered with Verbum to produce three libraries packed with the best content from Emmaus Road, Emmaus Academic, and Journey through Scripture. Check them out and share them with your friends or your parish priest. Verbum is the perfect gift for priests, deacons, seminarians, catechists, and youth ministers. Perfect for the layperson looking for a deeper understanding of Scripture and Tradition, with over 80 titles, including the RSVCE Bible, the Catechism of the Catholic Church, all the encyclicals of John Paul II and Benedict XVI, and the videos and books for The Bible and the Virgin Mary and The Bible and the Sacraments. Ideal for the amateur theologian, this library of over 250 titles brings together Church teaching, theologians past and present, and Bible studies and tools designed to help you read the Bible from the heart of the Church. Includes: The Code of Canon Law, the Summa Theologia, Letter & Spirit, vols. 1-11, and the Ignatius Catholic Study Bible: New Testament. Designed with priests and seminarians in mind, this library of over 400 titles covers the breadth and depth of the Church’s teaching and theological tradition, including the Early Church Fathers, Butler’s Lives of the Saints, the Navarre Bible: New Testament, and papal encyclicals going back to 1740. 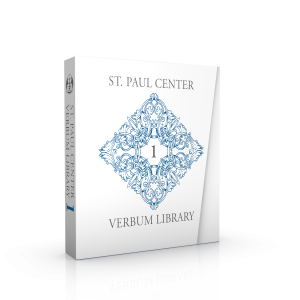 Looking for help with your St. Paul Center Verbum Library? If you already own a Verbum library or wish to upgrade from one St. Paul Center library to a higher one, you may be eligible for a dynamic pricing discount from Verbum.